We are back next to the entrance of Aintree Racecourse for our Pop-Up Village event. 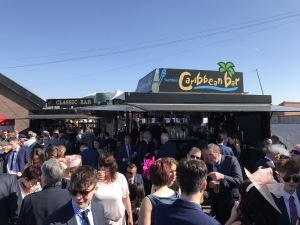 Expect to find a range of quirky bar offerings and entertainment throughout the 3 days of the Grand National race meeting. Starting on Thursday, and culminating in one of the largest days in the racing calendar, with the Grand National, it’s sure to be a busy few days!